There is a growing concern among those investing in REITs because an interest rate hike lingers on the horizon. The assumption is that REITs underperform when the cost of money increases due to its essential role in real estate investing. Investing in REITs is an effective strategy for earning passive income. That's because they're one of the fastest-growing classes of dividend stocks on the market. 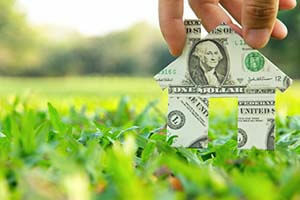 The National Association of Real Estate Investment Trusts (NAREIT) reported there were 216 REITs in the United States last year. That's a 59% increase from 136 in 2008. Real estate investment trusts (REITs) are companies that own or finance income-producing real estate properties. They're typically associated with shopping malls, offices, apartment buildings, and hotels. And several REIT IPOs have rocked the market in 2015. InfraREIT Inc.'s (NYSE: HIFR) deal in January raised $460 million, making it the largest REIT IPO since Paramount Group Inc.'s (NYSE: PGRE) $2.3 billion deal last November. In February, Easterly Government Properties Inc. (NYSE: DEA) and Great Ajax Corp. (NYSE: AJX) raised $180 million and $71 million, respectively. 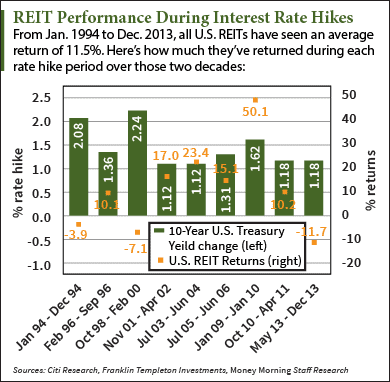 REITs have historically performed well during interest rate hikes. Interest rates rose by more than 1% nine different times between 1994 and 2013. During six of those nine periods, REITs provided positive returns. The most successful period for investing in REITs was the 2009 interest rate hike. From January 2009 to January 2010, rates rose 1.62% while the REIT sector saw a sky-high return of 50.1% over the same period. Recently, U.S. Federal Reserve Chairwoman Janet Yellen has been touting another rate hike. Again, some investors are wondering whether or not they should sell their REITs before it's too late. But Money Morning Chief Investment Strategist Keith Fitz-Gerald says any rate hike in the near future will have positive results. "It really doesn't matter much if this time is different than the others," Fitz-Gerald explained. "The principle is the same – there is a strong correlation between high total returns and the management approach taken to dividend policy." The REITs with the best returns during rising rate periods are equity-based REITs. These are the kind that directly invest in income-producing properties like shopping malls, offices, and apartments. They're less sensitive to interest rates because they usually see plenty of cash flow and appreciation to render any price drop associated with higher rates irrelevant. Those will fare better than mortgage-based REITs when rates rise. Mortgage-based REITs come under pressure because the value of their real estate holdings – which are mostly personal homes – decreases when rates increase. That's because high rates put pressure on the housing market and make buyers more hesitant to borrow money to purchase a home. Fitz-Gerald just found an equity REIT that taps into two of his "Unstoppable Trends." When a stock plays one of these trends, it's poised for incredible long-term growth.